The Rue La La ecommerce model has always been built upon exclusivity. The retailer’s members-only website brings high-end fashion products in limited quantity, evoking a sense of urgency amongst its 16 million members to make quick purchasing decisions before the product is gone for good. It’s been a model that has served the retailer well – as fashion trends are notoriously short-lived, channeling exclusive members towards the latest soon-to-be-displaced in-vogue collections instils a sense of privilege in customers that they are accessing wares (or should that be wears?) at the very forefront of fashion that non-members will perhaps miss. 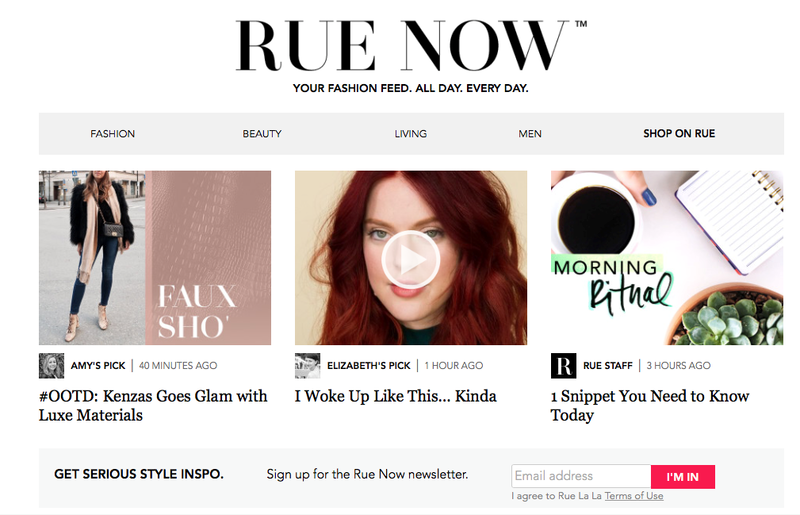 But now, Rue La La is branching away from ultimate exclusivity as it tries its hand at content marketing with the launch of a fashion editorial website and new content tab in its app – Rue Now. Unlike the rest of the Rue La La website – which requires users to sign up to the Rue La La membership program in order to login and view the flash sales on offer – Rue Now is accessible for anyone to read. Like Rue Now, the Rue La La app is also not a members-only platform – anyone can download the application from app stores and browse the products on offer, and now also read the Rue Now content. The app, indeed, is a strong sales channel for Rue La La. According to Rue La La’s senior mobile product manager Arash Hadipanah, 60% of the retailer’s sales come from mobile devices, between 75% and 80% of which via the app. Rue La La’s new venture into the realms of content marketing, however, aims to acquire even greater sales and even more new customers via the delivery of top-end fashion articles that are of high interest to followers of the brand. Standing at No. 68 in the Internet Retailer’s 2016 Mobile 500 Guide, Rue La La has enlisted the services of popular fashion bloggers and other fashion trend publishers, including Popsugar Inc. and Fashionista, to publish as many as 15 new articles a day on the Rue Now site. Some of the Rue Now articles feature items that are for sale, and will include a link to the associated product page on the Rue La La site. However, like all good content marketing initiatives, the Rue Now blog strives to add value to the overall Rue La La brand. Latest trends, makeup tutorials, and news about top fashion figures (amongst many other features) all make up the content of Rue Now. The result is that the expert content positions Rue La La as more than just a retailer, but a truly credible voice in the fashion industry, an authority that fashion consumers can turn to for information. Importantly, the brand lift that Rue Now gives to Rue La La converts browsers into buyers. For example, if a shopper reads an article about the quality of a new Louis Vuitton hand bag on Rue Now, she may be more inclined to buy one when she discovers that it is discounted on the Rue La La site – or at the very least sign up for membership so she can properly view the bag that she’s reading about. With Rue Now available as a tab on the Rue La La app, this process is made even simpler. With one swipe or click of a link, users of the application can flip straight into the shopping section after reading an article. “The fact that within the app you can browse before you become a member and you can have [the article] side by side will really help show why you should have a product,” Hadipanah says. Engaging consumers every step of the way on the path to purchase begins with brand and then product discovery. The Rue Now initiative is addressing these top-of-the-sales-funnel requirements directly. The content provided on the site – completely free for all, including non-members – positions Rue La La as a credible, trusted and loyal fashion partner in the consumer’s life, from where relationships can be nurtured and, ultimately, higher sales can be achieved. For now, Hadipanah explains, Rue La La is analyzing how shoppers engage with the content provided on Rue Now to see what sort of impact it has on customer acquisition rates, and is promoting the blog across social media. About John Waldron John Waldron is a technology and business writer for markITwrite digital content agency, based in Cornwall, UK. He writes regularly across all aspects of marketing and tech, including SEO, social media, FinTech, IoT, apps and software development.